Hugo Jacomet starts off at practically the very beginning of his book by telling the reader that this will possibly be a case of expectation versus reality. In this particular instance Jacomet clearly states that brands like Prada, Gucci, Dolce & Gabbana, Versace, and even Brioni are not included in this examination of the masters of Italian sartorialism, if there is such a word. Their glaring omission is due to their less than perfect execution in the manufacturing process. This is not a book about conspicuous consumption and hyped brands. From the get-go you realize that Jacomet’s pinpoint focus is all about the Michelangelos of men’s fashion/style, which includes everyone from fabric mills to retailers and everyone in between, who provide only the highest possible quality products and services to only the most discerning of craftsmen and consumers. To say that The Italian Gentleman is a labor of love would be akin to saying that Gianni Agnelli was a car salesman. Jacomet has sourced, spoken to, photographed, with his assistant, and discovered the master craftsmen who speak the rarefied language of Italian men’s style/fashion. These are no mere tailors or shoemakers or shirt makers but they are the crème de la crème within their métiers and the da Vincis of their particular professions. The most perceptive and savvy of readers will recognize the tales of these survivors, the lessons to be learned from doing what you do best no matter the circumstance, and most of all the author’s complete immersion and love of the subject at hand. The text is personal, conversational and shatters any preconceived notions about the concept of Italian men’s style. 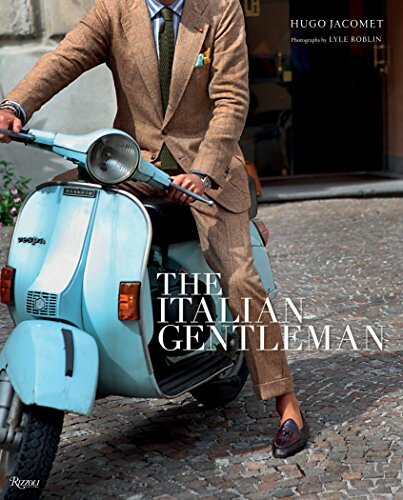 A majority of men’s fashion books speak of Italian men as having the je ne sais quoi quality of sprezzatura. Jacomet explains that even the most seemingly casual elegance of some Italian men is far more premeditated that you might think. Case in point is Gianni Agnelli, who is practically a patron saint of Italian men’s style, and how his wardrobe was built from the master with masterpieces that were made by these craftsmen. What also needs to be taken note of is that these artisans and manufacturers are in fact what modern men’s ready to wear was built upon. The book is exquisitely documented in both text and imagery and is clearly aimed at those who hunger for true knowledge about the highest quality Italian menswear. Bespoke is a word that is bandied about these much like the word icon, but here Jacomet proffers the real deal, the ones who actually are the quintessential purveyors of Italian men’s fashion and style. This is the ultimate guide to A-List brands for men who can afford this luxury.